Healthcare providers face enormous difficulties as they strive to keep pace with the demand for new digital health services and applications, devices, data backup, security, and privacy requirements. 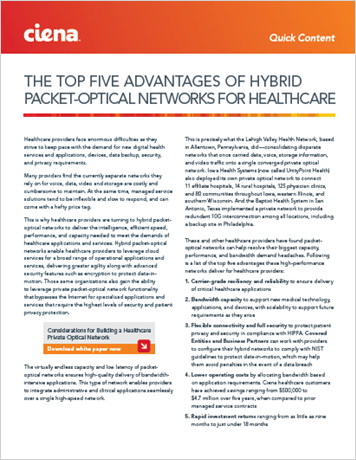 These and other healthcare providers have found packet-optical networks can help resolve their biggest capacity, performance, and bandwidth demand headaches. This paper outlines the top five advantages these high-performance networks deliver for healthcare providers.